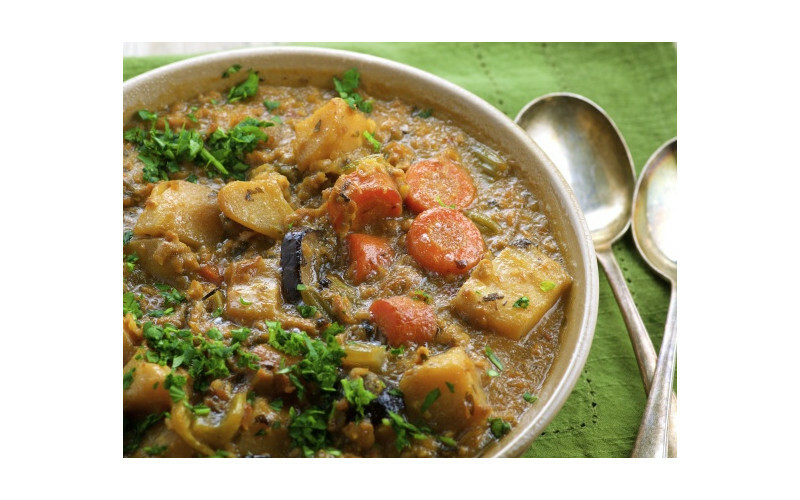 This is a great vegan version of a traditional dish. It's especially good with our Colcannon mashed potato recipe - try them both as part of a St Patrick's Day celebration - or any time, really! TVP (soya chunks) might seem a bit 70s retro but they work really well in this recipe and are extremely cheap to buy too. Some larger supermarkets sell them - alternatively, try a Holland & Barrett or other health food shop. If you can't get them then use the ready-made chunky strips option. 1. Prepare the protein option first. Soak the soya chunks in hot water for 30 minutes (you can prepare the rest of the dish while this is happening). Drain and squeeze out as much of the liquid as possible. Mix the flour with some salt and pepper then dredge the chunks in the flour. Shake off any excess flour but don't throw the leftover flour away, you'll need it to thicken the stew. Heat 1-2 tbsp oil in a small frying pan and sauté (gently fry) the chunks. Place in one layer and cook until nicely browned off - they should be a golden brown colour. Remove from the heat, place on some kitchen towel and set aside. These need to be added later in the dish rather than earlier so they don't lose their texture. Roughly chop up the strips into halves then dip in the seasoned flour mixture as above. Lightly fry until golden brown then set aside on kitchen towel. 2. Add the remaining oil to a medium-large saucepan and add the onions and garlic. Sauté until the onions are softened and translucent - about 3-4 minutes. Add some salt and pepper. 3. Add the rest of the vegetables and sauté until all the vegetables are coated with oil and have cooked in a little. 4. Add the remaining flour and cook it in well - about 1-2 minutes - stirring constantly so it doesn't catch but browns a little. 5. Add the beer and stock gradually plus the sautéed TVP chunks if using. Stir well to make sure the flour integrates well and doesn't go lumpy. 6. Bring to the boil, turn the heat down to a simmer, cover with a lid and cook for 30 minutes or until the vegetables are all cooked, including the potatoes. Add a little more stock if the stew looks too dry. 7. Add the sautéed chunky strips if using these instead of the TVP chunks. 8. Taste and season everything with more salt and pepper if needed. 9. Serve hot with mashed potato (eg Colcannon) and extra greens, eg cabbage, kale or spring greens.